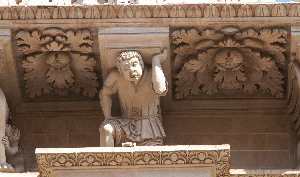 Unfortunately, the guardians of the Santa Croce (Holy Cross) basilica in Lecce refused to let me web-sling my way across the façade of this remarkable structure for a closer examination. I had to content myself with standing mesmerized for a few hours and simply staring at the bewildering ornateness. I took some photos, yes, but I'm still not sure if, among the thousands of sculpted figures and designs on the façade, some ever repeat or if they are all unique. As a non-architect, I don't know if this is an example of form following function or what. If the function is to show the magnificence of the Creator, a million-mile high, plain white façade would have done just as well. But if the purpose is to show the complexity of Creation—the sub-atomic particles nested within other sub-atomic particles, all of which may (or may not) really be vibrating strings and may be (or may not be) connected to alternate universes—then all I can say is that Richard Feynman probably built a time-machine (a piece of cake for him! ), packed a good pen-knife with his bongo drums and went back to the 15-and-1600s to help gifted but goofy stone-masons chisel and sculpt. It took 150 years to build Santa Croce, but given the nature of time travel, the professor could have spent a century-and-a-half happily hewing and still have squeezed it all in between his Monday 9 o'clock Physics 101 and his Tuesday 2 pm Really Hard Stuff 480 in a given week. In any event, among the various UNESCO criteria for inclusion on the World Heritage list, buildings must be "architectural works...of outstanding universal value from the point of view of history, art or science." Fittingly, then, since 2006 the architectural phenomenon known as the Lecce Baroque (Barocco Leccese) has been classified as a "tentative addition" to the World Heritage list. 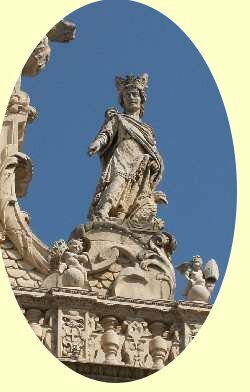 The abundance of structures built in the ornate style of the Barocco Leccese has earned the town of Lecce the nickname, "Florence of the South." Lecce is the capital city of the province of the same name in the Italian region of Puglia. The town is about 200 miles (300 km) ESE of Naples in the "heel" of the boot of Italy (technically known as the Salentine sub-peninsula), almost at the bottom. 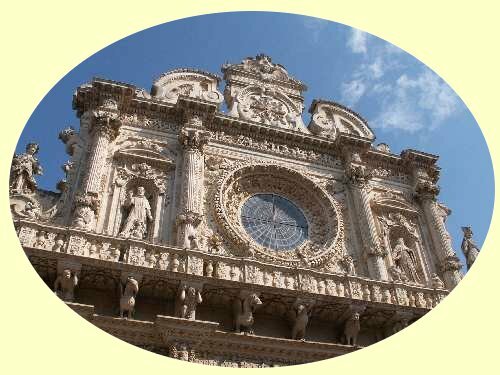 Lecce has been the artistic center of the area for centuries and contains a number of examples of this highly ornate architectural style, developed between the second half of the 1500s and the end of the 1600s. 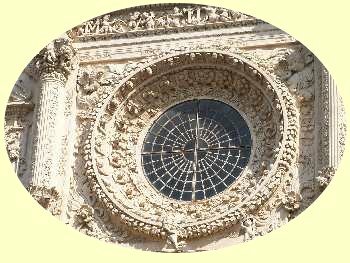 The Lecce Baroque arose within the framework of reformed religious orders such as the Theatines and Jesuits, and was an architectural manifestation of the new power of the Counter-Reformation, a power free to assert itself once the Battle of Lepanto (1571) had ended the Muslim threat to central Europe. Today, every alley, every street, every square not only in Lecce but also in Nardò, Gallipoli, Martina Franca, Ostuni, Francavilla Fontana, Galatina, Galàtone and many others, testifies to the wide range of expressive feats achieved by the ‘Barocco leccese'. 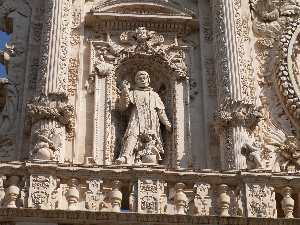 Besides the Basilica, other noteworthy examples in the town of Lecce, itself, include the Palazzo della Prefettura, the Palazzo del Seminario, the churches of Santa Chiara, SS. Nicolò and Cataldo, and del Rosario. The most striking example, in my view, remains the Basilica of Santa Croce. (All of the photos on this page are of the façade of that building.) 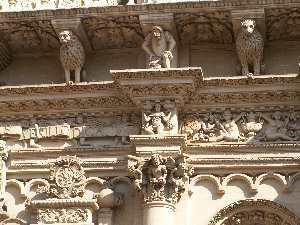 The façade is an astonishing array of gargoyles, corbels, festoons, columns and cornices crowded with human figures, flowers and animals, the precise rendering of which was made possible by the quality of the local limestone (called, indeed, "Leccese limestone" by geologists), a golden- or honey-colored stone as malleable as wood, soft enough to be carved with small knives. Interestingly, Baroque masons treated the finished pieces of sculpture with milk; lactose seeped into the pores of the stone and hardened it. Construction on the basilica of Santa Croce began in 1549 and was part of the renewal of the area declared by emperor Charles V as a response to the threat of an invasion of this particularly vulnerable part of Italy by the same force (the Ottoman Turks) that had taken Constantinople in the previous century. When that threat came and passed (with the Battle of Lepanto), local artisans exploded with creativity. The original designers and architects were Gabriele Riccardi, Cesare Penna and Giuseppe Zimbalo. The entire basilica, inside and out, is a catalog of mythology, religion and history, from the grotesque figures to the renderings of traditional Christian figures to the coats of arms of noble families and representations of Turkish prisoners taken at the Battle of Lepanto. Construction of Santa Croce was completed in 1695. Under Napoleonic rule at the turn of the 18th to 19th century, the basilica underwent a period of abandonment when religious orders were suppressed. Some restoration took place in 1828, and in 1906 the Basilica of Santa Croce was declared a national monument. It did not suffer considerable damage in WW II. The façade was restored in the 1980s. 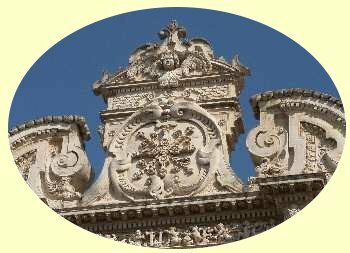 Architecturally, the Lecce Baroque is related to the similarly ornate style known as Spanish Plateresque (from plata, the Spanish word for 'silver', meaning in the manner of a "silversmith"—that is, intricate, fine, scrolled, etc.). It, too, reached its peak under Charles V and may be similarly seen as an exuberant declaration of the Counter-Reformation. It flourished in Spain, in parts of the New World under Spanish dominion and in much later revivals such as the "Spanish Colonial" style.